Well, not so blunt like that, it was way more eloquent, poetic and gentlemanly, as any proper Englishman would write. I replied, “Thanks John!” and a couple more generic, non-committal sentences – as um, anytime a handsome, young man emails me wishing to meet me in person, I sort of have an obligation to my husband to not accept random invitations from strangers. We ended up actually having a chance to meet in person, over a quick Lebanese lunch and wow, did we have so much in common! We were both talking so fast and furious about food, cookbook, life, wine, travel and blogging that the lunch was over way too soon. While John was here, I helped him with some television and radio gigs, intro’d him to some amazing people, like Rebecca Brooks, Janis my literary agent and my peeps at Momentum. I know you’ll see more of John – don’t believe me? Watch this pilot! 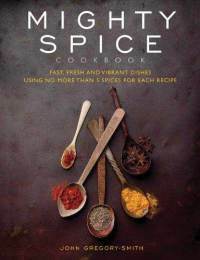 Mighty Spice Cookbook , , by John Gregory-Smith is available on Amazon ! I have just finished a crazy book tour of America. It was one of the most amazing experiences I have ever had and I can’t wait to return. My tour took me down to Florida, where for a few nights, I stayed at Steamy Kitchen HQ. 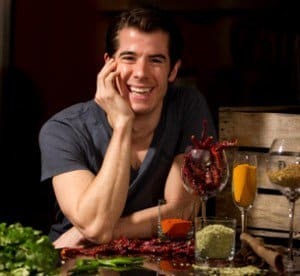 I had met Jaden in London, where we chatted about all things delicious over a huge Lebanese feast. I arrived late on a Tuesday night and was greeted by, a then hobbling – due to a Taekwondo injury, Jaden, who had a glass of wine on hand to welcome her British guest! Scott had been on BBQ duty and we had an awesome dinner, with one amazing Kale and Cauliflower Salad. Jaden had arranged for me to make an appearance on Daytime TV, the following morning, and pointed out that I had come a bit underprepared – I had no equipment apart from my food, Doh! After a whip round the kitchen I was ready to rock and the show was a blast! Jaden had started her epic vegetable garden, complete with real, live, flapping chickens. The guys took me for a closer look and it became very clear that I was useless at holding chickens! I live in central London and the only nature that comes my way is the occasional tree or what I find in the food market. Every time I was given one of the chickens to hold, they would sense my uselessness, flap off and carry on scratching away with their mates. That night we had a delicious, alfresco Mexican dinner, complete with chicken, salsas, salads and yummy cheese. After dinner and a few beers my sweet tooth kicked in and I was in desperate need of some chocolate. Well, once again, staying with a high profile food blogger paid off. I was presented with a sack load of chocolate to eat – by the way, I ate all but a few squares, which I left in the little fridge, sorry! The next day was a blur; up at 4am to catch a flight to Charlotte NC for a show, back to Tampa and 2 hour drive to Orlando to prepare for The Daily Buzz. It was so nice returning “home” to the Hair’s house, where we had a wonderful spaghetti and meatball dinner, with lots of lovely parmesan cheese! It was a delicious end to a wonderful few days. Jaden, Scott, Nathan, Andrew and Coco thanks so much for having me, showing me the fish, turtles, chicken, for all the laughs and great food! Come over and see me soon in London! 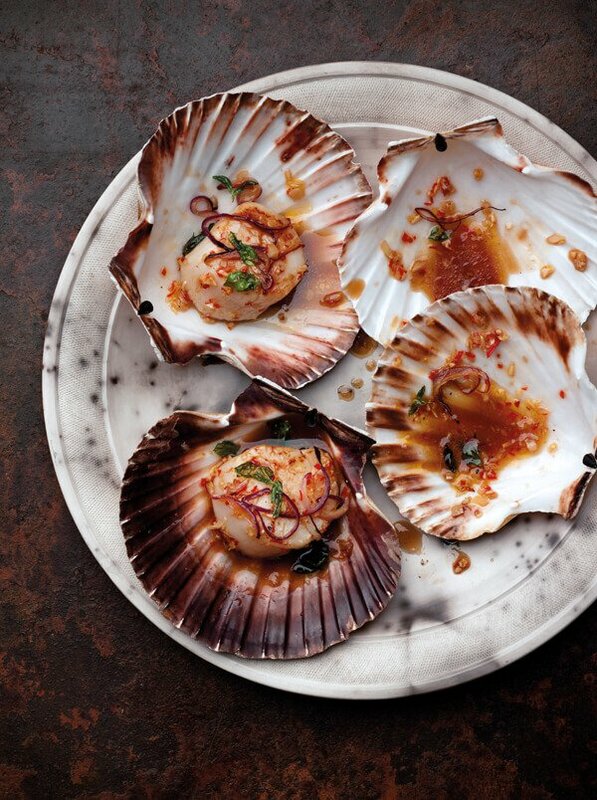 In the meantime, enjoy this Chili and Basil Scallops recipe from my new book, Mighty Spice. scallops start to turn golden at the edges. for presentation, if you like. I was able to get my hands on some fresh off the boat scallops and made this tonight with a few I had left and I am IN LOVE! Wow, this was amazing…… I can see trying to score some more of these scallops and doing this for friends. Really quick, and really, REALLY flavorable. Hi! I made your scallop recipe today, it was a hit, I added ginger to it and it was delish. Even the sauce left over was used up as a bread dip. Thank you! 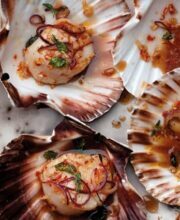 Just made these tonight with Digby scallops, so delicious. Definitely recommend and will make again! oo that’s so neat! I bet it was nice talking to him about cooking, foods, and whatnot 🙂 I love these scallops tho! They look beautiful! love scallops! the presentation is beautiful! Love your story and encounters like that! Very captivating and yet a story we could all relate to, of course not with foodies but with other amazing people. I’m also in awe looking at the beautiful scallops. Your photography is spectacular! Must improve mine, but dropped my camera a couple of times. Great excuse to get myself another one with video ;). Thanks for sharing the recipe! where do you find scallops with shells still attached. What a great post! I love hearing both accounts of your meeting 😀 These scallops are insanely beautiful. 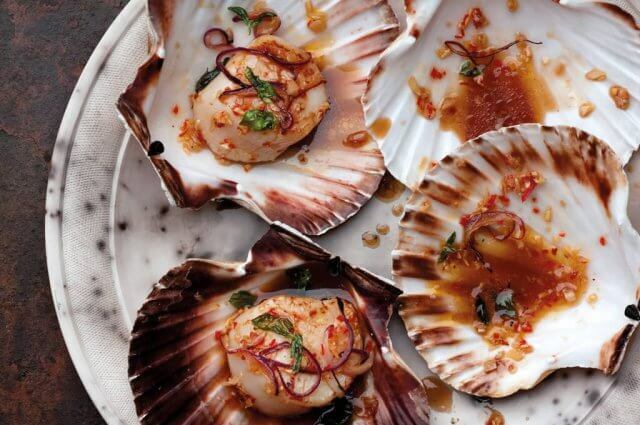 Definitely read all of John’s copy in an English accent and wow did he make those beautiful scallops so easy to make. Can’t wait to try it. Thanks for sharing! What an adorable guy! Thanks for sharing him with us all Jaden 😉 And those are yummy sounding scallops…will definitely be on the lookout in the market for some scallops now! (follow you on twitter & on the blog, 1st time commenting). I love scallops! We have awesome spice shops here in California, send this gent our way! 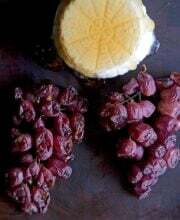 Thank you for sharing this recipe – this dish looks delicious and very fast to make.